The underlying values and personal characteristics of each generation can translate into distinct workplace characteristics. Each generation has their own set of work ethics, attitudes, and communication style that need to be handled differently. 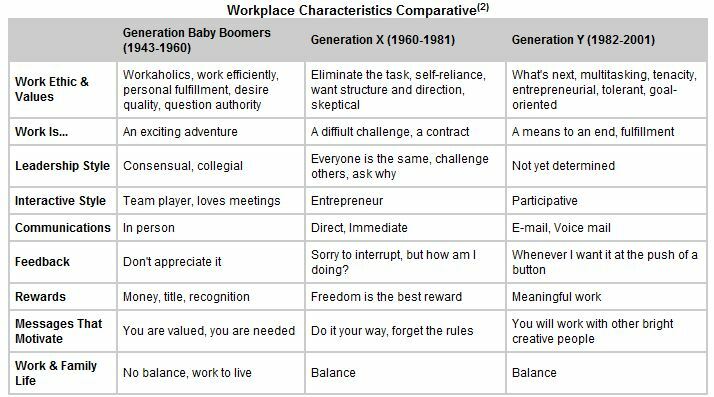 Comparing personal and work values across the generations, one can deduce what motivates each generation in their work life. Baby Boomers: Money is an important motivational factor, along with a strong title, recognition and respect. Gen X: They seek a work-life balance and is motivated by a job that fulfills them personally as well as financially. For them, money is a reward for a job well done, yet it does not add value to the job. Rewarding them with a membership to a golf club or a vacation will enable them to work towards the work-life balance. Gen Y: Friendship is such a strong motivator for them that Gen Y workers will choose a job just to be with their friends. Mixed with their sense of ethics, they are more likely to participate in activities to support a cause. Similar to Gen X, money is an important factor, but it is not a standalone. Having one company-wide policy on recruitment and retention may become a thing of the past as each generation has its own job expectations and desires. Anne Fisher, writer at Fortune magazine, writes on how Fortune 100 companies attract and retain Gen Xers. Autodesk, a software company, defies the Silicon Valley norm of workaholism: The company gives its employees six-week sabbaticals every four years and paid time off every month to do volunteer work. According to her article, “Gen Xers love this, because they want to make a difference”. A Generation X manager tells a Boomer he has been working too hard and should take time off to take the family on vacation. Instead of saying thanks, the Boomer replies, “I work to get ahead, to get a promotion, not for a vacation.” The next time that situation comes up, the manager might elect to give this particular employee a bonus, rather than suggest a vacation.